Need for Speed Underground 2 is the ninth installment in the long-running Need for Speed series of racing video games. It is often regarded by critics and fans alike to be the best NFS game, generally rivaled by Hot Pursuit, High Stakes and Most Wanted. 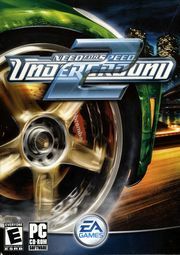 Taking place in a massive, free-roaming city called Bayview featuring five distinct interconnected neighborhoods, Need for Speed Underground 2 delivers an immersive game world where the streets are your menus. As players explore the city, they’ll encounter rival racers who will school them in the ways of the underground and tip them off to the hottest racing spots in town. Need For Speed Underground 2 takes place in Bayview after the events of Need for Speed: Underground. The prologue begins with the player driving in a Nissan Skyline in Olympic City, the setting of NFS:UG (though the racing scenes are actually in Bayview). He then receives a race challenge from a rather ominous personality who offers him a spot on his crew, but "won't take 'no' for an answer." The player races off — despite Samantha's warnings — only to be ambushed by a mysterious driver in a rage that totals his Skyline. The driver, who has a unique scythe tattoo, makes a call confirming the accident, and the flashback fades out. Fast forward to the present day, where we see the player arriving in Bayview via airplane, with a note from Samantha referring him to her friend Rachel (voiced by Brooke Burke), who will set the player up there. He also has the keys to Rachel's Nissan 350Z, which is waiting for him outside the airport. The player then has the option to complete a few races in the car before inevitably returning it to the car lot, where Rachel will give him an earful for being late before allowing him to choose his first vehicle. This one is free, as it was paid for by the player's insurance from his totaled Skyline. It is then that the player embarks on a quest to become the top racer in Bayview and eventually take down the man who sabotaged his ride in the flashback, who turns out to be Caleb. After winning many races, the player runs into Caleb's street racing crew, The Wraiths. The crew has the same vinyl, paint, and rim set. The player challenges them to a series of URL (Underground Racing League) races and eventually gets Caleb's second in command, Nikki, to join his side. Rachel tells the player that Caleb has been manipulating the sponsorship deals throughout Bayview towards him. After the player beats the Wraiths, an infuriated Caleb challenges the player to one final race in his custom Pontiac GTO. The reward for beating the game is all cars and almost all parts but the player unfortunately does not get Caleb's GTO. But, in order to beat the game at 100%, the player must go back and race the events on the World Map in the player's Garage. In the beginning of Need for Speed Most Wanted, a player is entering Rockport from the Underground racing scene, a connection between Underground 2 and Most Wanted. The Hottest Cars: More than thirty of the most sought-after tuner cars are available from the hottest manufacturers--from Mitsubishi Motors, Nissan, and Toyota to Ford and Volkswagen. If they’re hot on the street, they’re in the game. Visual Customization: With more than twice the visual customizations of last year’s game, there are literally billions of car combinations available to gamers. Featuring audio upgrades, scissor doors, spoilers, headlights, side skirts, roof scoops, hoods, rims, wide body kits, neon and more. If you can trick it out in real life, you can trick it out in Need for Speed Underground 2. Online: Gamers can put their reputation on the line, challenging the world’s best racers online for the PlayStation®2 computer entertainment system.